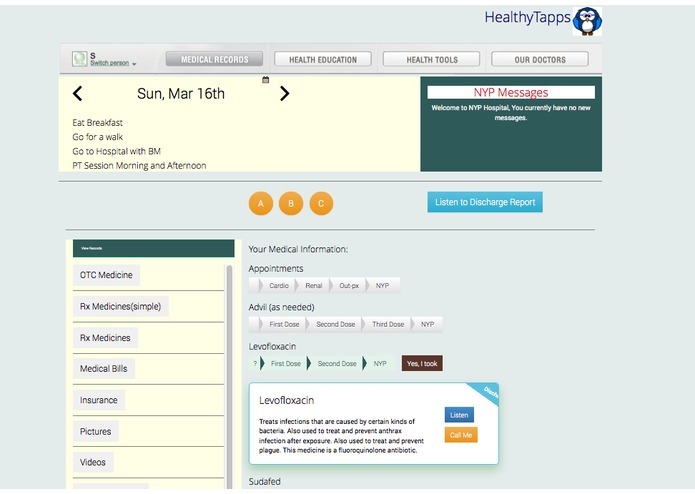 HealthyTapps is a patient engaging application built on Android and Win 8 platforms which in the log run will allow the capturing of click streams for big data analysis. This tool is designed to ameliorate the patient experience with their hospital and overall medical experience. Even more so, it was created to address the issue of patients being re-admitted to the hospital within 30 days of having been discharged and allows patients to easily engage with their medical team and their entire medical life in several, quick, and easy ways. We have designed audio and video interactions as well as the ability to access the tool using anything from a smartphone to a tablet to a standard desktop. With easy to understand instructions and explanations, the patient can follow regimens and stay on top of their health through a variety of visualizations and auditory components.